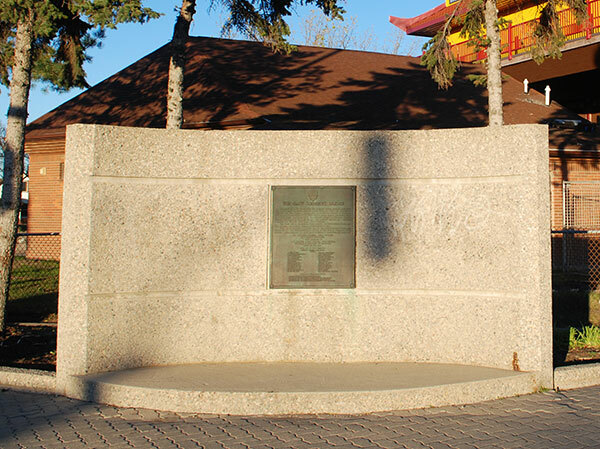 Located at the northeast corner of Salter Street and Dufferin Avenue in Winnipeg, this monument commemorates the construction of the Slaw Rebchuk Bridge, named for long-time City Councillor Jaroslaw “Slaw” Rebchuk. The plaque also describes the history of former bridge crossings at this site, the first of which was erected in 1898. That structure, along with its replacement in 1932, were both known as the Salter Street Bridge, with the latter serving until the present bridge was officially opened by Mayor Bill Norrie and Slaw Rebchuk on 29 October 1984. The bridge spans the Canadian Pacific Railway main line and marshalling yards, the city’s North End to the downtown. The plaque names others attending the unveiling ceremony, including Lieutenant Governor Pearl McGonigal, as well as members of the city council and the Board of Commissioners.